Celebrity Big Brother spoilers reveal CBS might be trying to hide Natalie Eva Marie and Lolo Jones‘ delusions. Most times the two have a serious conversation about the game, the live feeds cut or cameras switch to other houseguests. Is Big Brother covering up the increasing paranoia coming from the two women? It has only gotten worse after HoH Tom Green shocked the house by pulling Ricky off the block. 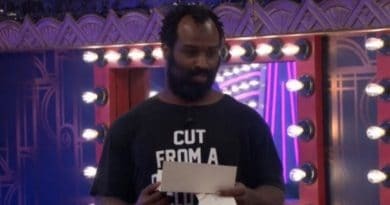 In a move that rocked houseguests and fans alike, Tom Green used the power of veto to remove Ricky Williams from the block. Since feeds were cut for a long period of time the past couple of days, it was hard to know what Tom was planning on doing with it. He put Lolo Jones up in Ricky’s place. Lolo had yet to touch the block this season. While the plan seems to be to backdoor Lolo, Tom would be getting out a huge threat regardless of which goes home. Tamar Braxton and Ricky Williams appear to be considering splitting their votes between the two. On the other hand, Dina Lohan and Kandi Burruss look to be aiming for Natalie Eva Marie. We might have the first HoH tiebreaker of the Celebrity Big Brother season if the celebs keep switching up the plan. For the other players, a tie would put all the blood on Tom Green’s hands, as he would have to cast the deciding vote to evict. Is Celebrity Big Brother Protecting Lolo Jones From Looking Bad? Most of the drama in the Celebrity Big Brother house this season has centered around Olympian Lolo Jones. The athlete has proved to be very sensitive and quick to attack anyone if she feels threatened. While live feeders know this, the viewers who just watch the episodes have almost no idea. CBS has left a lot of the Lolo confrontations out of hour-long episodes perhaps to protect her image. It has gotten to the point where even the Celebrity Big Brother spoilers live feeders are being kept from hearing all of Lolo’s thoughts. 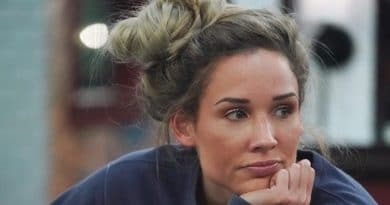 Lolo Jones has been known to complain a lot inside the house, but fans are getting a skewed image of her, a common thing in Big Brother for any season. For the past couple of days, live feeders have noticed a rise in the amount of times production cuts the feeds. They typically do so for nomination and veto ceremonies, competitions and leading up to live evictions. But now there are significant chunks that are missing. Many of them happen during a conversation between Lolo Jones and her ally Natalie Eva. Why is CBS trying to hide Lolo Jones and Natalie Eva Marie’s discussions? Lolo Jones has a tendency to bash other Celebrity Big Brother houseguests in the gold bedroom. Natalie Eva Marie is usually with her. Usually, right in the middle of a conversation the feeds will either cut or switch to another room. When this happens there is usually absolutely nothing is going on. For example, Lolo, Tamar, and Natalie were in the room talking about Kandi. Then feeds switched to Kandi who was in her room sleeping and stayed there. Fans that pay a monthly fee to watch the drama live are obviously frustrated. Be sure to follow Soap Dirt for all of the Celebrity Big Brother spoilers! ‘Celebrity Big Brother’: Is Lolo Jones a Sore Loser? – Threatens Ricky Williams – Insults Ryan Lochte?